Remember when, a few weeks ago, I wrote about how I am very nearly the slowest sewist alive, and I embrace that? Well, my friend Antoinette (of TangerineTrees) apparently decided to take that as a challenge. She invited me to the world’s-smallest-and-fastest-sewalong, since she had just acquired the Colette Violet pattern, and it had been languishing in my stash for a long while. Yes, I know that now is supposed to be the time to focus on the Laurel for a variety of reasons, but I guess we’re rebels like that. ;-) Join us in 2016 for our Laurel sewalong! I knew this would be a (hopefully wearable) muslin, but still, to trace/alter/cut/fuse/construct over the course of a few days would be a tall order for me. One that I failed at actually, but … I’m still calling it a win since I only finished one day late! 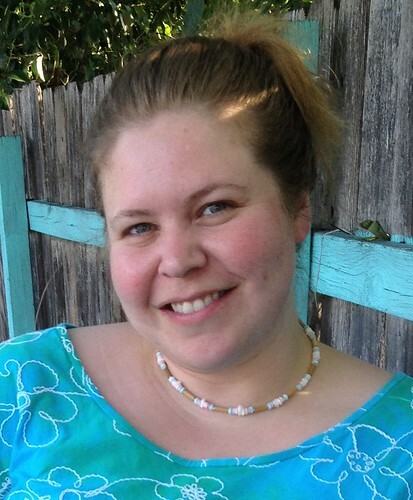 This was my first blouse with a collar, since I’ve fallen quite behind with the Archer sewalong. If only my hands would work as quickly as my plans. 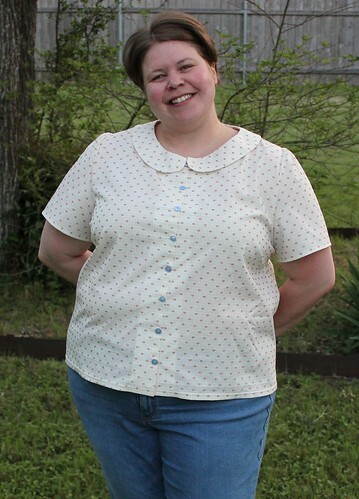 Regarding sizing, I wasn’t really sure which way to go, because this was my first Colette make — not counting the Taffy blouse, with which I went so far off course that it can’t be considered. I started with an 18 (46″ bust). I did this because, while I usually choose the 44″ bust size to fit my shoulders, I figured that the C-cup block would make a difference. It worked fine, but I will shave off a little from the front upper chest between the armscyes next time. Aside from that, the only other change I need to make is to pivot out a bit more at the hips, which is an adjustment that I should have made this time but miscalculated. So, I decided to slipstitch the whole thing in place so that the buttons will stay a tiny bit away from the edge of the placket. 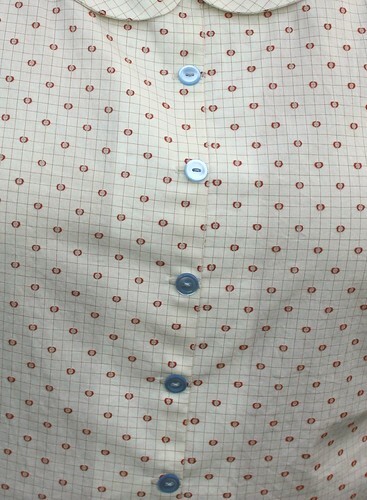 Fortunately the shirt can slip over my head so I don’t need the buttons to be functional. But yes, this slipstitching took quite a bit longer than unpicking the one buttonhole would have. Thanks for noticing. This is a VERY wearable muslin. Great job. And I promise that only you can see the “issues” with the buttons. Can’t wait to see the next ones. I can’t believe that’s your first collar! Darn good, lady! 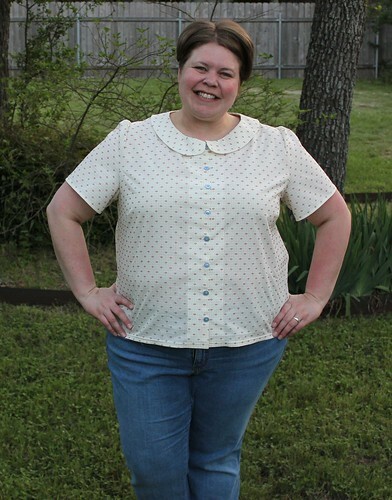 I love your fabric – has a vintage vibe, but perfect with jeans. Feel the fear and sew it anyway! See, collars aren’t that scary. Good job. Btw, the real problem with your buttonholes is not that the hips need to be graded out but that they should run parallel to center front on a shirt, not perpendicular. Buttons will always travel to the edge of the buttonhole in the direction of strain (just everyday wearing strain). That’s why ready to wear shirts have the buttonholes vertical (except for the one on the collar stand usually). Well done on your fast sew along. I’m thinking more challenges like this would be good for you. Hmmm…. Hey! Well done, and so fast! 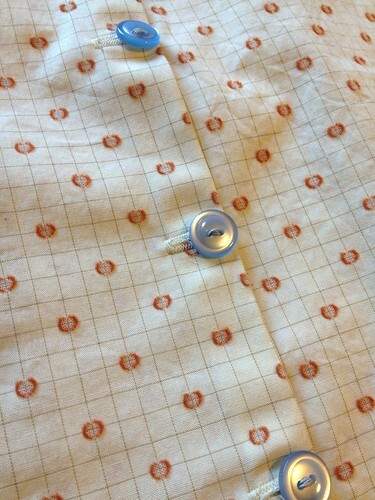 :) I love the big reveal you did, and I think your fabric and button choices are wonderful together. There were all manner of little picky things I didn’t dig with this pattern, and it has been a challenge to decide which are me and which are the pattern. The point in the comment above, about buttonholes needing to be parallel to CF, makes all the sense in the world. I thought it was odd that the buttonholes were perpendicular, but went with it anyway! Look forward to seeing the new blouse in person. Thanks, Megan! Actually, it’s both… I’m slow anyway, but exceptionally slow when trying new things. ;) People talk about whipping out simple t-shirts in an hour, but it takes me that long just to cut! S’ok though, it gets done!